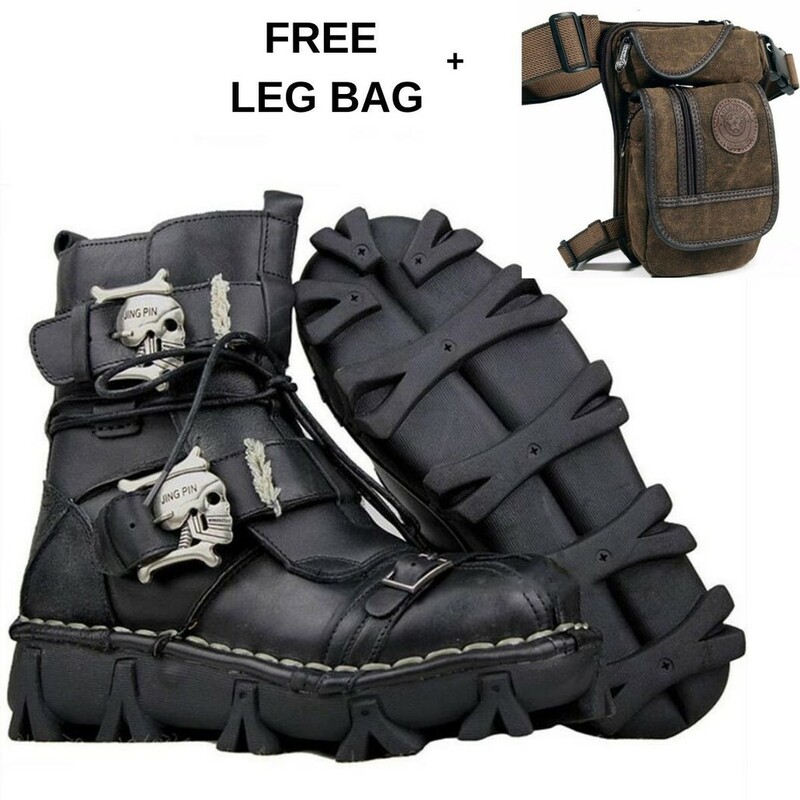 Handmade Leather skull boots + FREE leg bag!!! So as many of you guys know come this time of year, I started getting gear that I've ordered previously being sent to the house because riding seasons, fast approaching and this is the first thing that's arrived on the list coming up. Yeah. All right guys, you ready? I'm pretty excited about this. These, these I bought right here just to, just to kind of show you, I bought these $199 bucks on sale. The sale, just so you know, it seems to kind of always be there, but that's awesome. Still $200 right now. It says it comes with a free leg bag, which I didn't get when I ordered. So, a little sad but I did get a nice cool shirt, which is, which is all right. I like that. But here they are. Ready? boom, boom. Clickety do you guys can see those? I'll put them like that, there it is. I know you can't team up in this one, but you can see them down here. So I'm gonna kind of go over these. I bought these and I'm going to be completely honest because they're badass looking without question. These are smoking looking boots, right? I just was like, oh those are so cool. Why not? I got these and I want you to kind of see them. We're going to go over them. So first thing is when you look at their website reviews, not a lot of reviews but 10 10 reviews, so I'll take that and the Five Stars and I'm going to agree with it. I think these are smoking. Awesome. You know if you look at them, good, good, hard toe on them. There's a buckle here. Let's be honest. That's design wise. If you look through them again on this side, the same thing, buckle here, buckle here. Just so you know, there's lace, there's a nice little lace that comes with them. These, and this is, this is the reason for the lace. Okay. These, I don't want to say their cosmetic, but kind of cosmetic as in when I put mine on, even at the tightest hole. I guess they weren't as tight around my ankle as I'd probably want, which is why the lace was really important because I can just really cinch these in and get that nice and tight. Right. So the lace kind of goes, there's a little loophole on the side of the boot. There's a loophole on the back of the boot. There's another loophole on this side and then one on the front. So this one doesn't have them done up right now. The laces usually come inside one of the boots just kind of like this tucked in and at first I was like, why there are laces? There are no lace holes but it's kind of like a ski boot you just suit it up and you're good to go. You can get skulls on them, which that's awesome. Okay, so just so you guys can see this, I'm going to just undo this one. They do kind of tie-up, strap up like a ski boot, right? You kind of opens up here. You got a little, hopefully, you guys and see that little plastic which is going to keep this part of the leather closed. This comes on top. Nice and synch. And then these snap over again. This one down here, I don't think I, I touched it. I could I guess tight-knit but I don't know what it's going to do since the toes so hard. It is what that is. Let's, let's look at here. So it does come in two different colors so you can get it in a black, you can get it in a brown. I chose black because of course, I like black. But let's say you're an Indian rider and you're like, I got that Nice Brown Tan leather on my bike. Oh yeah, this would look sharp because size wise it does come in half sizes now just so you guys know sizes to fit on for me. Also, the other thing that I really like is I have a really wide foot and so because of that I'm always concerned when I buy boots or shoes that they're going to be tight. So these were nice and wide. So no concerns there. I would say that sizing is appropriate for what you would normally wear. Any shoe or boot. So for me, I wear about a 10.5. I ordered a 10.5, but it's great. If you come down here, let's see what it says. 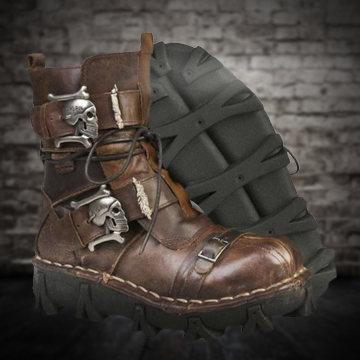 "boom, handmade leather skull boots plus. All right now free leg bag for you guys. Not For me. I do have one of those on order, so when it comes I'll let you got to see it built last. 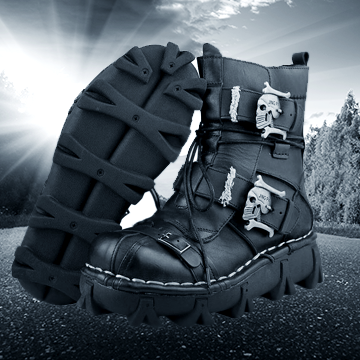 This pair of skull boots is simply a must-have." "Yeah. This brute of a boot has a durable handmade leather upper with silver hardware soft linings and a heavy duty oil resistant rubber outsole for a solid and clean step every time." And in addition to looking good, these aren't comfortable as well. The number one, I am going to 100% agree on the comfort. I put these on and weirdly enough my wife put these on and she was like, these are awesome. And I'm like, I know without question. I know super comfortable. The other one says "handmade, handcrafted leather". So the first thing to be aware of, these are really nice. I do find that the leather is soft. You know I have seen some leather boots in the ankle are a bit thicker, but for me they're plenty. It's still got some rigidity up here for sure. And if you look, I'll just bring that down here. It does have like extra padding inside to just kind of get that a little stiffer in and around the ankle areas. That goes all the way down in here. Comfort wise. And I wish I could show you this. Let's see. Can I bring out the insole? So here's, here's the kind of bring it up. Nope, it's in there. But just you guys know padding inside this boot. Honestly, one of the most comfortable motorcycle boots I have ever worn without question. Really, really comfortable. So no, no problems there. I think these are fantastic. Last but not least, and this is something to be aware of, these are tall, right? I easily will gain about an inch, inch and a half, two inches in height. Now that makes me feel much more predominant, which is awesome, but be aware depending on the bike you're riding. Primarily I ride an adventure bike. Not that I'm going to wear these on that bike, but I will wear them walking around town cause again they're comfortable, they look cool, etcetera. Sometimes I do get out on a cruiser, you know I go out for demo rides. This year we're going to Americades so I will write a ton of cruisers. You have to just be aware of how close or how tight your clutches, you may have to adjust the clutch lever on the bottom because on my bike these just won't fit. I'd actually have to lift that up just so you are because these are, these are, these are thick, right? You're, you're looking at a good solid two inches, you know, to maybe even more of height from the tread up to the toe. If you have a heel shifter, who cares? If you have a standard tow shifter, then you may have to lift the shift the shifter up a bit just to make sure your boots fit in there for me. I, because this is, you know, a nice leather, I would probably get one of those shift guards for your boots that you can get. And I know that these guys actually have those. So I'd probably get one of those. Just slide on in regards to the actual soul. Check those out. Right. Those are massive. Super Awesome. What does it say? "Heavy duty oil resistant rubber outsole. Yeah, that's gonna. That's gonna stick on there. Nice. Alright, so soft. I couldn't believe how comfortable these were". All right guys. Um, I'm going to leave a link down below to these guys. 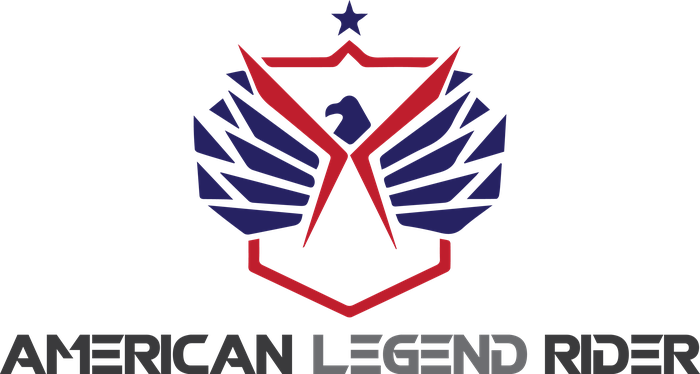 American legend rider. Take a look around, follow the link. I'm going to be getting more stuff from them. Uh, I put it in a fairly big order because I really liked the way some of their stuff looks. Those are going to be coming up soon. All right guys, these are the, what are these called? Handmade leather skull boots from American legend rider. Yeah. And right now as filming, you guys would get a free leg bag. I think that sells regularly at around $50 us. So that's cool. All right. My friends linked down below. Go take a look. Snoop around their site, and I think even right now, what does it say? They have a 15% off new season sale code. They always have codes up there, but use them, Why not save some money? Alright guys like, comment, share and subscribe. These are awesome. Alright, we will see you guys in the next video. Have a good, my friends riding season is coming. It's coming soon. Later. Yeah, these are right, right? Yeah, these are all right. All righhhht!